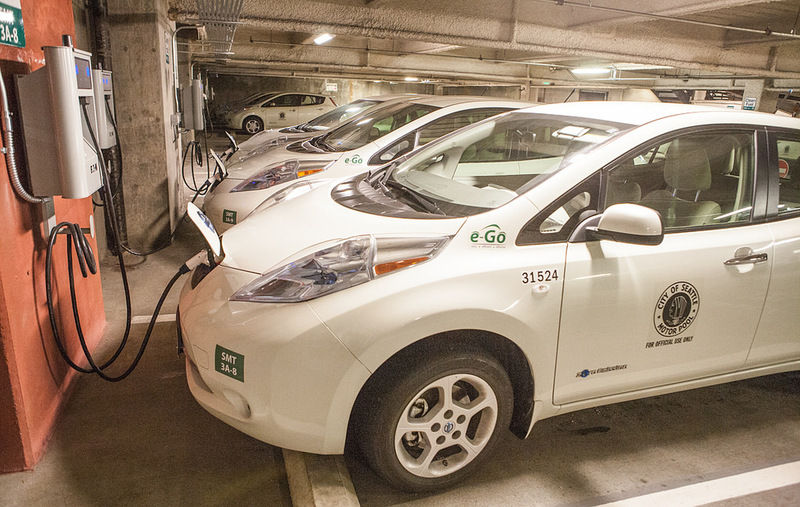 The City of Seattle fleet is made up of more than 4,000 vehicles, 87 of which are battery electric. Expanding the number of electric vehicles is an ongoing effort that has the city has promoted in lockstep with its electric vehicle (EV) charging infrastructure. It has more than 80 Level 2 chargers and is in the midst of a large EV infrastructure expansion project that will add more than thirty charging stations, including several DC fast-charging stations. According to a recent report on EV promotion from the International Council on Clean Transportation, Seattle has more than twice the 25 largest US city average of publicly available DC Fast and Level 2 chargers per capita. Leadership from the city will be an important factor in maintaining healthy growth in EV adoption at a city agency and metropolitan level. The City of Seattle has used total cost of ownership analysis to demonstrate that, despite higher upfront costs than comparable internal combustion vehicles, battery electric vehicles can be more cost effective in the long run even without incentives. The city is achieving these savings by applying upfront capital toward initial vehicle marginal costs that, on balance, will save the fleet on operations and management down the road. When considering the investment in charging stations, Seattle opted to take a similarly long-term approach and found that EV infrastructure reduces operations and maintenance budgets, nearly eliminates costs associated with fuel administration for those vehicles and provides the city with a more robust and diverse fuel supply. On the August 6 West Coast Electric Fleets Webinar, Green Fleet Coordinator Andrea Pratt explained: “There’s lots to navigate in these early stages [of EV infrastructure adoption], but don’t get discouraged! Because in terms of solutions, I think it’s imperative to frame EV infrastructure as a capital investment to the facility and approach it as a modern-day fuel station.” Besides immediate benefits of charging infrastructure for overall facility infrastructure (e.g. improved asset value of building, electrical service benefits for all building tenants etc. ), EVs can be valuable to facilities as a potential source of reserve power for emergency situations as well as reducing dependency on petroleum, whose price is far more volatile than electricity. All of these factors supported Pratt’s pro-EV case to her colleagues in the Central Budget Office, and were also valuable when seeking support from local philanthropic grantmakers, utilities, state agencies and corporate sponsors.